Order now and get access to three powerful video trainings designed to help you make the most of your encore years. Get tips from the experts on how to combine purpose and a paycheck, advice on how to use your own life story to influence change, and digital tools to help you connect the generations. To get your bonuses, place your order by November 20, then click here. New research from Stanford University shows that nearly all of us want to live with meaning and purpose, but few of us have really figured out how. In this webinar, two of the leading voices in the encore movement — Michelle Hynes, an experienced career coach, and Marci Alboher, author of the The Encore Career Handbook and former New York Times careers columnist — will share advice and perspective for blending purpose, passion and a paycheck at any stage of life. If you want to lead change within a group of any size, there’s one story you must tell: the “Why I Do What I Do” story — or what Harvard Kennedy School professor Marshall Ganz has called “The Story of Self.” It’s the story that lets others know what gives you a personal sense of mission, what values guide your work, and why they should follow you. In this video, internationally recognized storytelling expert Andy Goodman will show examples of “Why I Do What I Do” stories and offer guidelines to help you craft yours. Thanks to technology, members of different generations have never had so many opportunities to connect across age and distance. Through his GrandparentsAcademy.com, digital engagement expert Aaron Larsen has taught thousands of grandparents worldwide how to use social media to enrich relationships with loved ones. His viral intergenerational posts have been shared nearly 350,000 times and have reached over 20 million people. In this video training, Aaron – now a member of Encore.org’s team — will share his top tools, tips and resources to help you connect in fun and meaningful ways with other generations online. To get your bonuses, place your order by November 20, then click here. Sign up here to get a downloadable book discussion guide, updates on book events, and more about Encore.org’s Gen2Gen campaign. 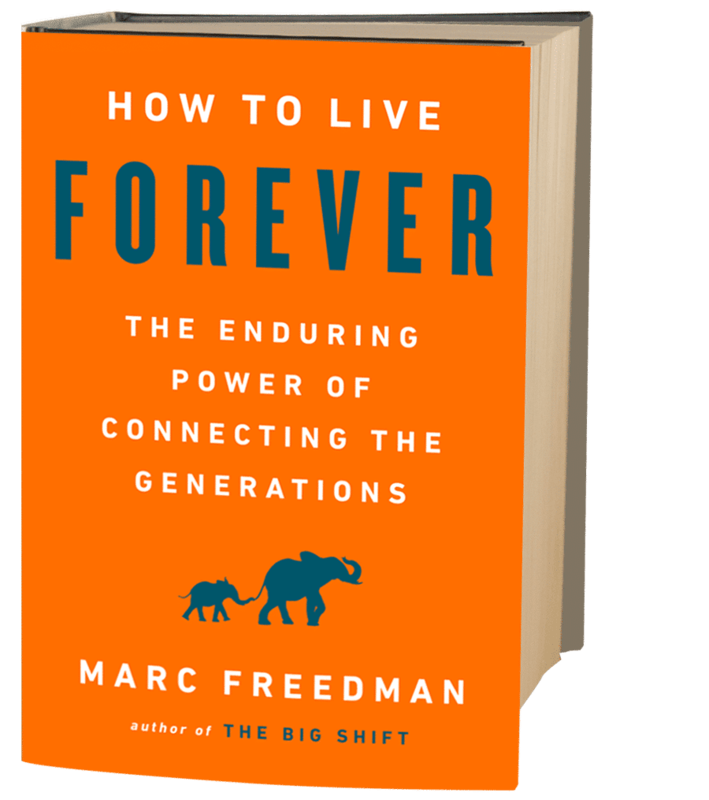 Thanks for your interest in "How to Live Forever". We'll be in touch!